Prime minister Manmohan Singh has supported the moratorium on Bt brinjal by the Union minister of state for environment, Jairam Ramesh. Singh qualified his support by saying the period of the moratorium will be decided by the Genetic Engineering Approval Committee (GEAC); the committee would also resolve the conflict among scientists on allowing commercial production of the genetically modified (GM) crop. Singh decided to uphold the moratorium after a meeting with four Union ministers at his residence on February 24. Ramesh, human resource minister Kapil Sibal, agriculture minister Sharad Pawar and science and technology minister Prithviraj Chavan attended the meeting. 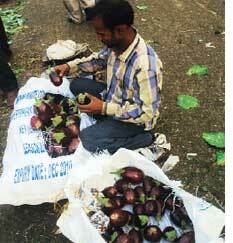 Pawar had sought the prime minister’s intervention after Ramesh overturned GEAC approval for Bt brinjal on February 9. After the meeting, the prime minister’s office issued a statement saying biotechnology is an important option for food security in the country but it has to be ensured that there is no adverse impact on public health and biodiversity. The press release also emphasized on providing stimulus to public and private investments in biotechnology by moving a bill to set up a biotechnology regulatory authority. The bill is likely to be presented in the Parliament in April. Anti-GM groups are opposing the bill and are garnering support of political parties. “We are trying to meet Parliamentarians to brief them about the bill,” said Jagannath Chatterjee of a non-profit in Bhubaneswar, Living Farms (see ‘Billed to confuse’, Down To Earth, March 15, 2010). Kerala agriculture minister M Rathnakaran has sent a detailed critique of the bill to all Parliament members from Kerala , Pawar, Ramesh and to agriculture ministers of other states.